I'm once more working full time down in the Silicon Valley, so things are probably going to slow down a bit on the HP-24 project. However, we got a lot of stuff done in the spring Akafliegs, and I look forward to a lot of solid weekends on the project. Also, Brad's going to be plugging away on the Glidair version, and also on some parts of the HP-24. 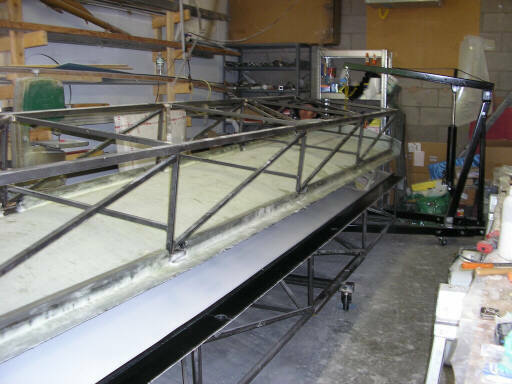 Since the last Update, we've finished the basic work on all four wing molds; the most recent big thing was last Thursday when we bonded the steel support truss onto the last mold shell, the upper left. On Friday we cracked open the left wing molds and got the plug out. 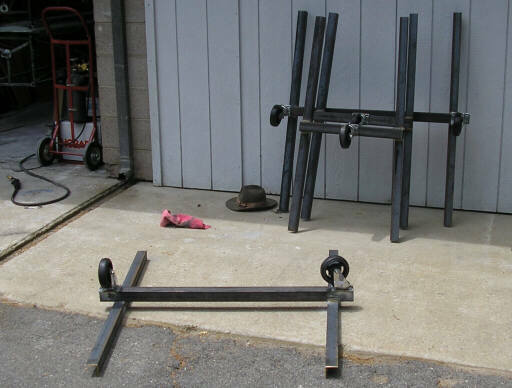 Also, I welded up two sets of wheeled carriages that we will use to roll the wing molds around between the shop bays. 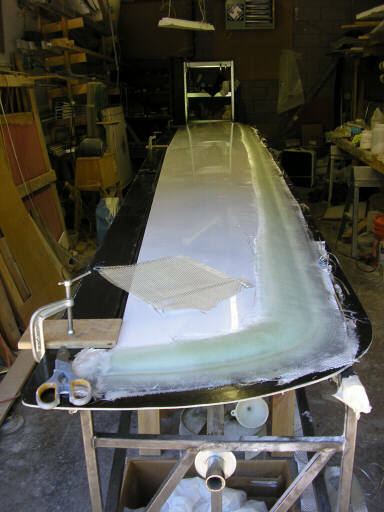 More recently, on Saturday 3 June Brigitta and I put the plug back in the mold and laid up the molding feature that forms the joggle that joins the left wing skins along the leading edge. These removable pieces attach to the upper wing skin molds. 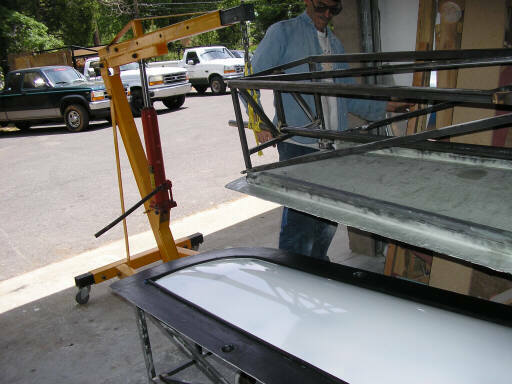 After this part cures, we will remove it from the mold and then lay up fiberglass on its molding surface equal to the expected thickness of the lower wing skin. The left wing molds, separated. The lower mold is on its carriage on the floor. At the tip, swinging the hoist out of the way so we can roll the lower mold into the other shop. The left joggle flange feature, laid up. We'll trim this to a width of 1.5" after we separate it.